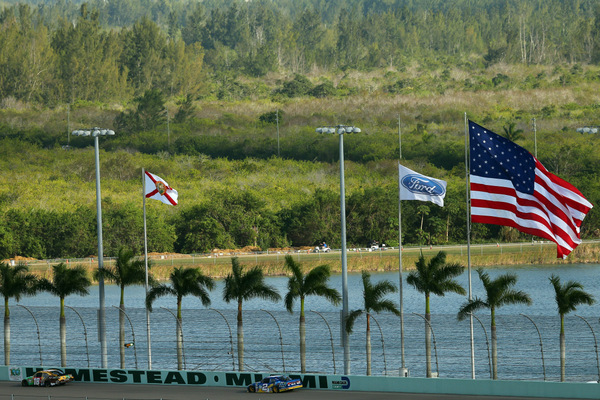 Yes, at the end of Sunday night's NASCAR season finale, 10 long, hard months after the tour opened at Daytona, Brad Keselowski did indeed finish off an unexpected title run by capturing the Sprint Cup championship for Roger Penske here at Homestead-Miami Speedway, in front of a packed house on a beautiful day for racing. "This has been one hellava day, this is one hellava team....and I guess I've got a little buzz right now," Keselowski said, wildly enthusiastic in victory lane. "Life is a team sport...."
It was, perhaps to be expected, a stock car racing season finale that didn't really go quite as expected. 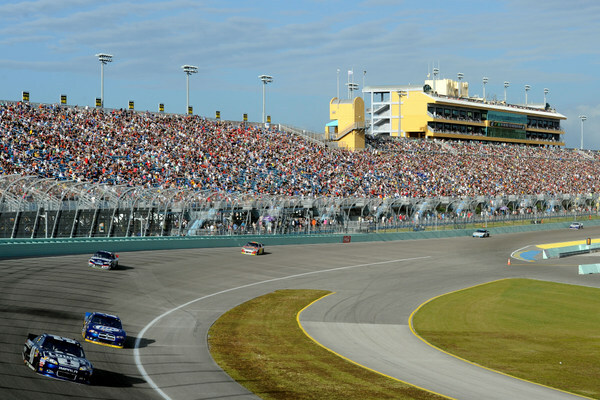 First Keselowski all but threw away the title, with a surprising gas mileage no-stop pit call mistake, with 150 miles to go in the Homestead-Ford 400 miler. 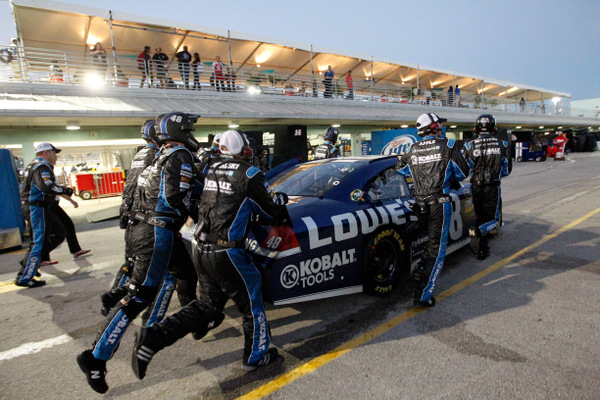 Then Jimmie Johnson, on the brink of a stunning comeback for a sixth title, watched his crew make a critical pit road mistake with 80 miles remaining, that put the game back in Keselowski's hand. Then Johnson's drive train broke just 60 miles from the finish, ending NASCAR's 2012 playoff chase, sending the five-time champion behind the wall, and essentially clinching this year's Sprint Cup championship for Keselowski and team owner Roger Penske. Johnson finished 36th, his worst finish since that Daytona 500 crash in February. It's a first for the Keselowski, just 28 and in only his third full season on the tour, and a first for the legendary Penske, some 41 years after his first NASCAR Cup run. And Bowyer wound up second to Keselowski in final standings. Bowyer's season, his first with Toyota's Michael Waltrip, was chasing Gordon down the stretch, in a very interesting subplot. Kyle Busch dominated the race, but the final 150 miles went green, and gas mileage became key. In fact Keselowski, by not pitting routinely when Johnson did at that last yellow of the day, set up a potentially championship winning scenario for Johnson -- who could have made the distance on just one more stop, while Keselowski would have needed two. Then, while trying to stretch his fuel, Keselowski ran out under green with 93 miles left. Fortunately for Keselowski he ran out just before the entrance to pit road, and he could pit without stalling on the track. With all that, Johnson was leading the race and Keselowski was 24th and deep in the pack with just 90 miles remaining. At that moment Keselowski's title hopes looked dead in the water. 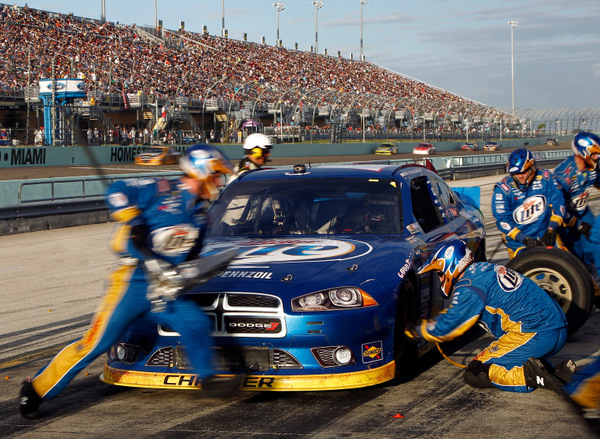 Johnson made his final planned stop with 80 miles to go....and just as it appeared Johnson was going to pull out a miraculous finish and win his sixth championship, disaster struck -- a crewman left a lug nut off, prompting a NASCAR penalty, which put Johnson a lap down, 25th. Keselowski right then was seventh yet needing one more brief stop for gas. And the title chase suddenly ended abruptly just a few moments later, when Johnson's drive-train broke, sending him back to the garage and leaving Keselowski to run out the championship clock. "That was probably the toughest race of my career," Paul Wolfe, Keselowski's crew chief, said. 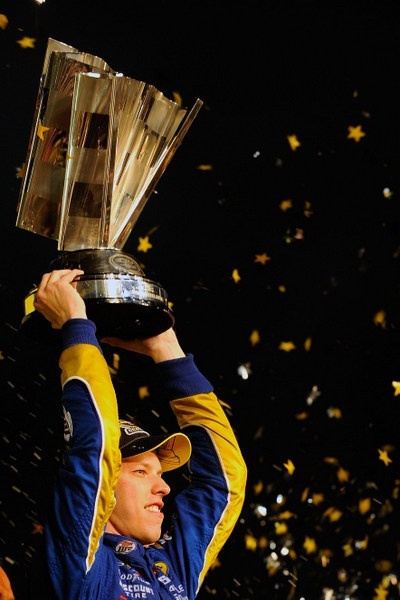 "I'm so thankful that we drove back to 15th, so that I don't have to hear for the rest of my life about how if he had not had problems, he'd have won the championship," a relieved Keselowski said. "It took till this year for me to realize that was right. I'm not big enough, not fast enough, not strong enough. No team or no person is. Only a team can do that and these guys up here. They make me big enough. They make me fast enough. They make me strong enough to do anything we want to do. "It's because of these guys. I can't be here without them. I really can't. "This isn't a one-man effort. I might get the glory, but it's about these guys, about my family. Without them, I'm nothing." Johnson, despite the bitter disappointment of these final eight days of the long, long season, was classy afterwards. "Through my disappointment I'm happy for Brad, and Paul, and Roger," Johnson said. 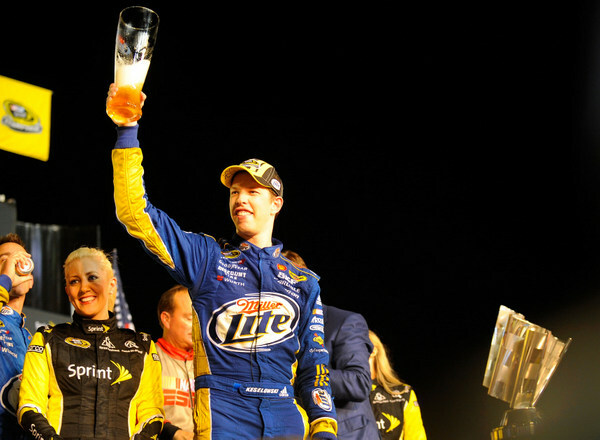 While Keselowski was making the most of his Miller Lite sponsorship in victory lane, in an almost giddy performance, Johnson was reviewing his disappointment. Just a few days ago Johnson was leading the Sprint Cup standings by seven points over Keselowski. 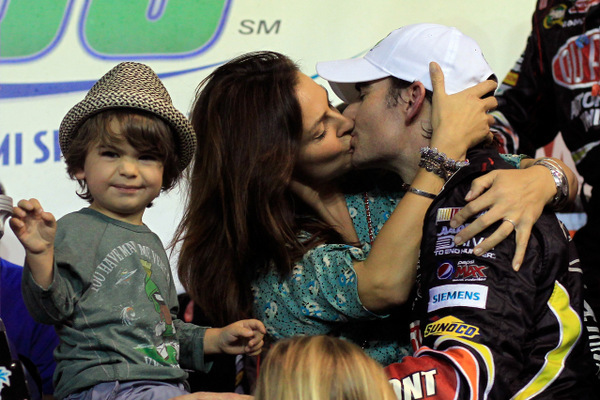 But he blew a right-front tire at Phoenix and hit the wall, all but dooming his title hopes. Johnson came here 20 points behind, a virtually insurmountable spread. Yet Johnson gamely played out the weekend, and most of the race too: "We were in position, and putting pressure on Brad like we needed to. "I said 15th isn't a layup, and I certainly had him in position." Keselowski had only to finish 15th here to clinch the title. However Keselowski and Wolfe played it surprisingly cautiously. And that strategy nearly back-fired. "We were in position to win the race," Johnson said. "We had a great strategy. We were definitely in the catbird seat. "Brad made it really interesting," Johnson said of those ill-timed pit calls. "I think they were trying for track position, and probably a little frustrated stuck in the middle of the pack. It's tough to really race hard when you come down here and you have something to protect. I've been through it enough. "And I definitely think those guys were feeling it today....maybe outside of their game a little... and going for the fuel mileage... and it gave us an opportunity. "Unfortunately we couldn't execute at the end. "There was oil under the back of the car. I'm not sure if a fitting busted, or a line hit by debris, but something back there allowed the car to puke out gear oil. "It puked all the gear oil out and burned up the gear. "But we were right there in position, and putting pressure on like we needed to. "It all unraveled pretty quick: the pit road thing -- I was dealing with it the first two or three laps. But I ran a handful of laps and then I could smell some oil. When the gear failed, there was a lot of shaking in the car. I knew it was big and going to be fatal." Gordon, who many thought might be suspended for this race after he deliberately crashed Bowyer at Phoenix in a pique of anger, played the gas mileage game perfectly in taking the. But he was chased hard by Bowyer in the final miles. "Can you believe that?" Gordon said with a grin. "There was one restart where I had Joey (Logano) and maybe Aric (Almirola) and Clint right there surrounding me. "That thing is going to work itself out some way through racing. I felt terrible how I went about it, and I still regret the way I went about it. But, I can't take it back. "But what we can do is look forward and race guys as hard and clean as we possibly can. This is a great way to get some positive things going because this year has been really up and down. "This is just huge. Man, it’s been an emotional week and a hard one; one of the hardest ones I’ve ever gone through just looking back on my decision." "I am so glad it's over," Bowyer cracked. "Now I am going to do whatever I want. Have a couple of beers, hunt something, have a couple of beers. "The only thing going through my mind at the end was catching Jeff....probably going through your mind too." Submitted by Josie on Mon 11/19/2012 - 05:44. I was on the "anyone but JJ" side...and was really nervous as "5 time" looked to be heading for "6 time". But it worked out and the wait was worth it! Watching Brad celebrate...from his first interview until his last on Wind Tunnel...was absolutely hilarious! It's obvious the kid can't hold his beer...and the Sports Center crew were really egging him on! I don't envy him the massive hangover he surely has this morning...but congrats to Penske and the team! Submitted by Fazzer Sports on Thu 12/27/2012 - 10:02. Great site. Keep up the great work covering nascar!